Devils Postpile National Monument is located near Mammoth Lakes in the Eastern Sierra Nevada Mountains. At the south end of the monument, you’ll find the lovely 101-foot tall Rainbow Falls. 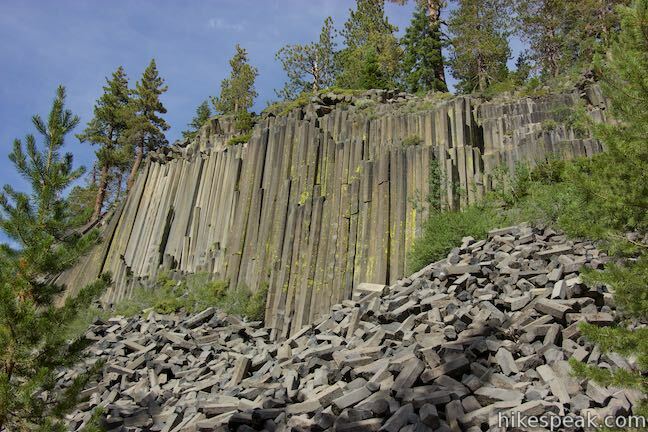 The monument’s main attraction is the Devils Postpile Formation, which has unique 60-foot tall cliffs made of basalt columns. Devils Postpile National Monument is surrounded by Inyo National Forest (which includes Ansel Adams Wilderness). The park is shaped similar to a column of basalt. Looking down from above, the park is a long north-south rectangle that covers 800 acres. Originally part of Yosemite National Park, Devils Postpile lost its protective status in 1905 with pressure from local mining interests. They planned to dynamite the postpile to make a rock dam on the river. This threatened not only the postpile formation and falls, but this vital watershed. Activists persuaded President William Howard Haft to restore federal protection to Devils Postpile and Rainbow Falls by proclaiming the national monument in 1911. This group of trails in Devils Postpile National Monument all start from the same trailhead at the north end of the monument. Each trail links to its own report complete with photos, maps, directions, and all the other information needed to locate and enjoy these trails. An interactive map showing the location of each trail is also provided.